Great Problem-Solvers, Super People, Their Spirits Linger, Their Legacy Continues . . .
SuperSMITH(TM) is a registered trademark belonging to Fulton Findings (TM), replacing the name WinSMITH(TM). ...+ Classes, Schedules, Consulting, Handbooks, Software, Version Info. ...E-mail Addresses, Sites & Telephone #'s. Wes Fulton and Dr. Bob Abernethy would like to thank Paul Barringer, John Fulton, Nozar Jafarey, Patrick Heatherington, and Kevin Van Fleet for helping us onto the WWW. Others who deserve recognition for help in this area are Jorge Granada, Vicky Peralta, and Ivan Cala. We also appreciate the recognition of our minimum packaging efforts in all of our products and our contributions to reducing the unnecessary distribution of paper. This web site keeps that tradition and will remain relatively free of unnecessary and cumbersome graphics or at least will have a warning. Our purpose is to provide useful promotional information, not artwork. Dr. Bob Abernethy wrote the first Weibull Handbook. Wes Fulton wrote the first widely used Weibull software. They have been developing Weibull PC software for over thirty years, much longer than anyone else. There is no more complete Weibull analysis program available or even close in specific Weibull capability. Many of the features are not available elsewhere. The SuperSMITH and WinSMITH (for software) and other 'SMITH trademarks belong to Fulton Findings. 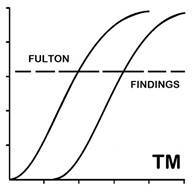 The Fulton Findings trademark belongs to Wes Fulton. All other software trademarks belong to their respective businesses. WeibullNEWS is trademarked by Dr. Robert Abernethy. The New Weibull Handbook is copyrighted 1993-present by Dr. Robert Abernethy. All of our trademarks and copyrights will be protected to the full legal extent. Mention of persons, products and services herein is for information only and they may or may not be endorsed by Fulton Findings. Please contact us for more information as indicated in the E-mail Addresses, Sites & Telephone Numbers section. This section presents the latest update on the leading edge of Weibull analysis. UPGRADE TO THE LATEST SuperSMITH (TM) SOFTWARE IN MINUTES: Now you can download the latest DEMO versions of SuperSMITH Weibull and SuperSMITH Visual software over the internet in just a few minutes and change them to the FULL version in seconds with your `Special Name` password. This makes getting started with Weibull a lot easier, and upgrades to the latest version are quicker than ever. CLICK HERE to read about how you can do it. This section has possibly surprising information to update Weibull users. HPGL GRAPHICS: HPGL (Hewlitt-Packard Graphics Language) capability does not come automatically with Word or Excel or PowerPoint anymore. HPGL is a special graphics output format available in the SuperSMITH(TM) software. To get HPGL output from Fulton Findings(TM) software, do the following. With a plot showing on the main screen, select Print/Firm Copy/Soft Copy / Export and then set Output Type to FF Picture File HPGL. Then click on the green checkmark, enter the file name (with .HGL extension) and the main results graphics will be saved into an HPGL format file. NOTE: Be sure to use .HGL for the filename extension so you can remember that it was saved in this special graphics format. Run the program HPGL2WMF.EXE that comes with the latest version of the SuperSMITH(TM) software (in the SuperSMITH group under START). Select FILE and then load the .HGL file you just saved. You can then save the results into a .WMF file (Windows Meta-File) for inserting into one of the Microsoft Office products. In Office (Powerpoint for example), select Insert, Picture, From File and the file should appear as a choice (if it has the .WMF extension). After inserting, the picture should appear as if it came from a plotter. With the cursor over the inserted graphic, do a right-side mouse click to bring up the menu of choices, and then select GROUP from this menu. Select UNGROUP and then each line and label will become a separate object that you can customize! LANGUAGES: The SuperSMITH(TM) software programs are available in eight languages now. English, French, German, Swedish, Spanish, Dutch, Portuguese (Brazilian), and Italian language translations are loaded automatically with the current versions. New languages are easy to add, please contact Wes Fulton of Fulton Findings as listed in E-mail Addresses, Sites & Telephone #'s, if you want to assist in getting the software translated into other languages or if you have suggestions on improving existing translations. Our new tutorial is ready. Click here for price and availability. The new tutorial is a complete self-study course when combined with The New Weibull Handbook (c) and SuperSMITH (TM) software. We have named the tutorial, PlayTIME (TM) with SuperSMITH. Click here to access a simulated portion of the tutorial (Note: graphics included). In the simulated tutorial likelihood ratio confidence is demonstrated including benchmark and validation data. Click here for a more complete description of the tutorial. Our tutorial methods are designed to help the novice to get up to speed quickly with Weibull and lognormal capability. Click Here to visit Paul Barringer's website. He has a great feature called Problem of the Month (P.O.M.). It presents complete case studies including a description of the situation, measured data, investigation paths, and solution output usually in easy-to-grasp graphical form. The P.O.M. illustrates the use of Weibull and other analysis tools. It is well worth your time. Old problems of the month are available for review as well. See the table below for the current Weibull training schedule. Wes Fulton and Carl Tarum do many PUBLIC and PRIVATE Weibull training workshops for engineers, technicians and managers. The classic presentation is a 3-day COMPLETE Weibull/Lognormal workshop. Another Weibull training format is separate sessions including the 2-day BASIC Weibull/Lognormal Workshop and the 2-day ADVANCED Weibull/Lognormal Workshop. The ADVANCED workshop can be held immediately after the BASIC workshop for the same people or for different people if desired. Holding them back-to-back gives a 4-day extended workshop session with a discount for reduced travel costs. Most of these hands-on problem-solving sessions are comprehensive Weibull seminars with COMPLETE SuperSMITH(TM) SOFTWARE INCLUDED. In such a workshop Each student receives FULL versions of the SuperSMITH Weibull software, SuperSMITH Visual software, and SuperSMITH Ybath(TM) software. The regular purchase price of a license for these programs was $840.00 USD as of this writing, but they can be included with the seminar at no additional cost. Each participant also receives The New Weibull Handbook(c) by Dr. Bob Abernethy plus the PlayTIME(TM) computer tutorial with over 50 problems and coaching notes for learning the software. Please Contact Wes Fulton for pricing and availability for these seminars. NOTE: Most PRIVATE Workshops include complete training plus the full software package and are presented to you at your facility. They are very cost-effective giving full training for each participant plus the full software package for each participant for LESS than the cost of receiving the software package alone! Private Workshop pricing is based on eight (8) participants minimum with a nominal charge for each of those above the first eight. PUBLIC Workshops are cost-effective when the quantity of participants might be lower. Click here for Weibull/Lognormal Workshop curriculum and agenda descriptions and on-site workshop information. For more than 30 years in addition to PUBLIC workshops hosted by SAE, DSiAC, Quanterion, The University of Tennessee, and other technical organizations. We have produced PRIVATE Weibull training workshops for organizations all over the world including government organizations such as the U.S. Navy, U.S. Air Force, U.S. Army, NASA, JPL, the Federal Aviation Administration (FAA), and U.S. Department of Transportation (DOT and NHTSA). We have provided Weibull training for hundreds of corporations as well. 23 APR - 3 MAY 2019. VACATION (Wes), Italy and Greece. 29 APR - 01 MAY 2019. PRIVATE COMPLETE WORKSHOP hosted by PROFITABILITY LLC (Jose Wilkins) for INTEGRA LIFE SCIENCES, Mansfield, MA (USA). [Carl] . . . For information on having a private workshop for your organization please contact Wes Fulton as indicated in E-mail Addresses, Sites & Telephone #'s. 6-8 MAY 2019. PRIVATE 2.5-DAY COMPLETE WORKSHOP for PHILLIPS 66, Linden, NJ (USA). [Wes & Carl] . . . For information on having a private workshop for your organization please contact Wes Fulton as indicated in E-mail Addresses, Sites & Telephone #'s. 8-10 MAY 2019. PRIVATE 2.5-DAY COMPLETE WORKSHOP for PHILLIPS 66, Linden, NJ (USA). [Wes & Carl] . . . For information on having a private workshop for your organization please contact Wes Fulton as indicated in E-mail Addresses, Sites & Telephone #'s. 14-16 MAY 2019. PRIVATE 3-DAY COMPLETE WORKSHOP hosted by QUANTERION for the U.S. NAVY, China Lake, CA (USA). [Wes & Carl] . . . For information on having a private workshop for your organization please contact Wes Fulton as indicated in E-mail Addresses, Sites & Telephone #'s. 10-12 JUN 2019. PRIVATE 3-DAY COMPLETE WORKSHOP for DANA, Maumee, OH (USA). [Wes & Carl] . . . For information on having a private workshop for your organization please contact Wes Fulton as indicated in E-mail Addresses, Sites & Telephone #'s. <Proposed> 17-21 JUN 2019. PRIVATE 3-DAY COMPLETE WORKSHOP hosted by QUANTERION for SAFT America, Jacksonville, FL (USA). [Wes & Carl] . . . For information on having a private workshop for your organization please contact Wes Fulton as indicated in E-mail Addresses, Sites & Telephone #'s. <Proposed> 26-28 JUN 2019. PRIVATE 3-DAY COMPLETE WORKSHOP hosted by SAE. [Wes & Carl] . . . For information on having a private workshop for your organization please contact Wes Fulton as indicated in E-mail Addresses, Sites & Telephone #'s. <Proposed Alternative> 8-12 JUL 2019. PRIVATE 3-DAY COMPLETE WORKSHOP for BOEING, Ridley Park, PA (USA). [Wes & Carl] . . . For information on having a private workshop for your organization contact Wes Fulton as indicated in E-mail Addresses, Sites & Telephone #'s. 16-18 JUL 2019. PRIVATE 3-DAY COMPLETE WORKSHOP for the FEDERAL AVIATION ADMINISTRATION (FAA), Oklahoma City, OK (USA). [Wes & Carl] . . . For information on having a private workshop for your organization contact Wes Fulton as indicated in E-mail Addresses, Sites & Telephone #'s. <Proposed Alternative> 22-26 JUL 2019. PRIVATE 3-DAY COMPLETE WORKSHOP for BOEING, Ridley Park, PA (USA). [Wes & Carl] . . . For information on having a private workshop for your organization contact Wes Fulton as indicated in E-mail Addresses, Sites & Telephone #'s. For more information on SAE public and SAE-sponsored private workshops please contact SAE as indicated in E-mail Addresses, Sites & Telephone #'s. For more information on UTK public and UTK-sponsored private workshops please contact UTK as indicated in E-mail Addresses, Sites & Telephone #'s. For more information on Quanterion public and Quanterion-sponsored private workshops please contact Quanterion as indicated in E-mail Addresses, Sites & Telephone #'s. 28-31 JAN 2019. PUBLIC RAMS CONFERENCE EXHIBIT at the Contemporary Resort, Disney World, Orlando, FL (USA). [Wes & Carl] . . .
ON DISPLAY IN OUR BOOTH: The latest Weibull Engineering tools in SuperSMITH(TM) software from Fulton Findings(TM) plus the latest edition of The New Weibull Handbook(C) by Dr. Bob Abernethy and the newest edition of the PlayTIME(TM) tutorial booklet and new unique capability for Weibull and Crow/AMSAA solutions. For more information on the RAMS conference please contact RAMS (more formally ARMS?) as indicated in E-mail Addresses, Sites & Telephone #'s. 28-30 MAR 2019. PRIVATE COMPLETE WORKSHOP hosted by PROFITABILITYLLC (Jose Wilkins) for SOUTHERN UNIVERSITY AND A&M COLLEGE, Baton Rouge, LA (USA). [Carl] . . . For information on having a private workshop for your organization please contact Wes Fulton as indicated in E-mail Addresses, Sites & Telephone #'s. 13-15 MAR 2018 (last year). PRIVATE 3-DAY COMPLETE WORKSHOP for Johnson & Johnson Medical Devices, Irvine, CA (USA). [Wes] . . . For information on having a private workshop for your organization please contact Wes Fulton as indicated in E-mail Addresses, Sites & Telephone #'s. 20-22 MAR 2018 (last year). PRIVATE 3-DAY COMPLETE WORKSHOP for the Federal Aviation Administration (FAA), Oklahoma City, OK (USA). [Wes & Carl] . . . For information on having a private workshop for your organization please contact Wes Fulton as indicated in E-mail Addresses, Sites & Telephone #'s. 27-29 MAR 2018 (last year). PRIVATE 3-DAY COMPLETE WORKSHOP for American Axle Manufacturing (AAM) hosted by The Society of Automotive Engineers (SAE), Auburn Hills, MI (USA). [Wes & Carl] . . . For information on having a private workshop for your organization please contact Wes Fulton as indicated in E-mail Addresses, Sites & Telephone #'s. 1-3 MAY 2018 (last year). PRIVATE 3-DAY COMPLETE WORKSHOP hosted by Quanterion for Sandia Laboratories, Albuquerque, NM (USA). [Wes & Carl] . . . For information on having a private workshop for your organization please contact Wes Fulton as indicated in E-mail Addresses, Sites & Telephone #'s. 8-10 MAY 2018 (last year). PRIVATE 3-DAY COMPLETE WORKSHOP for Harley-Davidson Motor Company, Milwaukee, WI (USA). [Wes & Carl] . . . For information on having a private workshop for your organization please contact Wes Fulton as indicated in E-mail Addresses, Sites & Telephone #'s. 26-28 JUN 2018 (last year). PRIVATE 3-DAY COMPLETE WORKSHOP for NAVAIR hosted by Quanterion, Jacksonville, FL (USA). [Wes & Carl] . . . For information on having a private workshop for your organization please contact Wes Fulton as indicated in E-mail Addresses, Sites & Telephone #'s. 27-29 AUG 2018 (last year). PRIVATE 3-DAY COMPLETE WORKSHOP for Navy Air Station North Island, San Diego, CA (USA). [Wes & Carl] . . . For information on having a private workshop for your organization please contact Wes Fulton as indicated in E-mail Addresses, Sites & Telephone #'s. 25-27 SEP 2018 (last year). PRIVATE 3-DAY COMPLETE WORKSHOP for Quantitech, Huntsville, AL (USA). [Wes] . . . For information on having a private workshop for your organization please contact Wes Fulton as indicated in E-mail Addresses, Sites & Telephone #'s. 2-4 OCT 2018 (last year). PRIVATE 3-DAY COMPLETE WORKSHOP for Barrick Gold, Elko, NV (USA). [Wes] . . . For information on having a private workshop for your organization please contact Wes Fulton as indicated in E-mail Addresses, Sites & Telephone #'s. 13-15 OCT 2018 (last year). VACATION in South Carolina for 90th birthday of ex-mother-in-law (that`s right, some of them are super special!). 19-21 OCT 2018 (last year). VACATION in Palm Springs, CA, for wedding of neighbor (can`t miss that!). Week of 23-25 OCT 2018 (last year). PRIVATE 3-DAY COMPLETE WORKSHOP for Grote Industries, sponsored by SAE, Madison, IN (USA). [Wes & Carl] . . . For information on having a private workshop for your organization please contact Wes Fulton as indicated in E-mail Addresses, Sites & Telephone #'s. 2-9 NOV 2018 (last year). VACATION south of border. 26-29 NOV 2018 (last year). PRIVATE 4-DAY COMPLETE WORKSHOP for Johnson & Johnson / Janssen, International SKYPE Session. [Wes & Carl] . . . For information on having a private workshop for your organization please contact Wes Fulton as indicated in E-mail Addresses, Sites & Telephone #'s. 29 NOV 2018 (last year). PRIVATE HALF-DAY MANAGEMENT OVERVIEW for Johnson & Johnson / Janssen, International SKYPE Session. [Wes & Carl] . . . For information on having a private workshop for your organization please contact Wes Fulton as indicated in E-mail Addresses, Sites & Telephone #'s. 4-6 DEC 2018 (last year). PRIVATE 3-DAY COMPLETE WORKSHOP for Sikorsky, Stratford, CT (USA). [Wes & Carl] . . . For information on having a private workshop for your organization please contact Wes Fulton as indicated in E-mail Addresses, Sites & Telephone #'s. Catch our byline on the latest research update in Weibull analysis. The Weibull Team of Wes and Dr. Bob share their research findings with you before it appears the next paper or textbook. Other researchers and contributors are included with special additions by Paul Barringer. This periodical is now available on the Web at the link below. Contact Wes Fulton or Carl Tarum if you have questions. Dr. Bob Abernethy and Wes Fulton are The Original Weibull Team (TM) responsible for the technical breakthroughs implemented in SuperSMITH(TM) software and documented in The New Weibull Handbook (C). Click here to see pictures of the team members. Prices and descriptions for software and books follow. Please contact Wes Fulton or Carl Tarum for the latest update or if you have any questions. Purchase directly from this website (click on selected item below to start) by American Express, Mastercard, Visa, Discover, or Check card and allow 1 week for delivery. Purchase from authorized distributors by American Express, Mastercard, Visa, check, money order or purchase order and delivery can be the next business day. Overseas purchases should be prepaid with respect to merchandise, shipping/handling, and any bank charges before delivery begins. Checks must be drawn on a bank with American affiliate. The credit card logos and trademarks shown above belong to their respective banking organizations. Authorized software distributors include Wes Fulton, Carl Tarum, and a few select others. Includes Industry Standard FULL version of the SuperSMITH(TM) Weibull software, SuperSMITH Visual software, and SuperSMITH Ybath(TM) software . . . NOTE: The price shown here is the base price for SSS upgrades and discounts. Contact Wes Fulton to order. Select above to download. Can be converted to FULL capability with a Special Name password provided upon purchase of license. This DEMO alters your input data so answers are not for originally entered data . . . otherwise it is the same as the FULL capability version. Can be used free by students to bring in files saved by a teacher using a FULL version (then the input data is not altered). Select above to download. Useful with our DEMO software. Also, can be used with the FULL software. The DEMO PlayTIME Tutorial booklet uses input data files (saved by a FULL software version so the data values are not altered) which are already included with the free DEMO software. Overview from Dr. Bob including PowerPoint presentation of 7 case studies, a Word document for detailed explanations, and a 20 minute video with 3 life data case studies and one for manufacturing analysis (made in 1982 and shown in the Weibull Workshop). Leverage our 100+ years combined experience in fixing tough issues to help with your challenging questions. No travel compensation is needed for consulting by teleconference and email. NOTE: All prices are subject to change without prior notice. Prices for products with the Weibull Handbook were changed starting APR 2017 due to new licensing agreement with Dr. Bob. UPGRADE DISCOUNTS: Previous owners of software can upgrade to the latest version of the same software for 30% of the current purchase price if the previous version is no more than one year old. The upgrade price is 50% of the current purchase price if the previous version is more than one year old. Another option is to purchase a yearly "maintenance" contract for 40% of the current purchase price payable each year with 2-year minimum to start. Maintenance allows the purchaser to upgrade to the latest version at any time during the year length of the contract. Click Here for Quantity Discount, Site License, and Server Environments and more information on Upgrades. Prices are subject to discount for multiple purchase. Click Here for Licensing Information. This is a copy of the installation instructions and general licensing information. Click Here for software security information. This is a copy of an email on this by Carl Tarum. We ship 32-bit software compatible with 64-bit operating systems (for XP/Vista/Windows7/Windows8/Windows10/). SHIPPING/HANDING (S/H) FOR SOFTWARE ONLY: Standard S/H within the U.S. is $10.00 for the software only (no books). The standard S/H going outside the U.S. is $25.00 for the software only (no books). Standard U.S. delivery is 3 business days and standard delivery outside the U.S. for many locations is 3-5 business days. Express FEDEX 2-Day S/H for software only (no books) within the U.S. is available for an additional $15.00. Electronic transmission of the software only (no books) is possible (see DEMO description with password unlock to FULL status capability). SHIPPING/HANDING (S/H) FOR ITEMS WITH BOOKS: Standard PRIORITY MAIL S/H within the U.S. is $20.00 for items with books. The standard PRIORITY MAIL S/H going outside the U.S. is $40.00 for items with books. Standard U.S. delivery is 3 business days and standard overseas delivery for many locations is 3-5 business days. Express FEDEX 2-Day S/H for items with books within the U.S. is available for an additional $20.00. Contact Wes Fulton or Carl Tarum for more pricing information. You can purchase Weibull and reliability software/handbooks from us or from the professional organizations and suppliers listed in E-mail Addresses, Sites & Telephone #'s. Detailed product descriptions are given in the Software and Handbooks sections. This section describes the latest versions and revision updates. The Latest Version Release of SuperSMITH(TM) Weibull, Visual, and Ybath(TM) is . . .
5.0DJ (Released 21 JAN 2019). Click here for a complete revision history of SuperSMITH(TM) Weibull. Click here for a complete revision history of SuperSMITH(TM) Visual. Click here for a complete revision history of SuperSMITH(TM) Ybath(TM).